Altogether, 316 different pollutants were detected in U.S. water utilities. Forty-nine of these were measured in one place or another at levels exceeding federally-set health guidelines, thereby contaminating the drinking water of over 50 million Americans. Agricultural pollutants, industrial chemicals from factory discharges, and urban storm water runoff were major contributors as were, ironically, chemical residues from water treatment plants. Particularly worrisome is that the U.S. Environmental Protection Agency (EPA) has set enforceable standards for fewer than half of the pollutants that were found. The rest are exempt from any health or safety regulations and are legally allowed in any amount. The last new drinking water standard was set in 2001. Aware that the public lacks confidence in the safety of drinking water, EPA Administrator Lisa Jackson announced on March 22, 2010 that the Agency plans to develop improved strategies to address drinking water contamination. Any impact on municipal water supplies would be well into the future, however. To review the detailed results of any water utility’s tests, go to http://www.ewg.org/tap-water/home and type in the zip code or water utility company name. Despite the unwelcome news reflected in EWG’s database, it’s hard to come up with a good reason to substitute bottled for tap water. If the price tag doesn’t dissuade – bottled water can cost 1,000 times more – maybe knowing that tap water quality is more closely monitored than bottled water will. Moreover, no matter what idyllic water source is depicted on the label, at least one-quarter of bottled water is just reprocessed tap water, including top-sellers Dasani and Aquafina made by The Coca-Cola Company and PepsiCo, respectively. Even bottled water’s promise of better taste can be misleading: In hundreds of taste tests pitting popular brands against local tap water conducted by the non-profit organization Corporate Accountability International, most tasters could not tell which was which, according to spokesperson Christina Rossi. What’s more, bottle labels are not required to list contaminants or additives. Whilst it’s certainly true that consumers are free to contact the manufacturer listed on the label to ask about contaminants, that’s of little help to the average shopper. When I phoned customer services at PepsiCo, verbal assurances were offered about the Aquafina’s purity but formal documentation of water quality was not made available to me. The Coca-Cola Company, however, did provide an undated “example” analysis of Dasani listing three contaminants out of 25 tested substances. EWG recommends installing home water filters and offers an on-line tool that walks you through the steps to find the right one for your needs: http://www.ewg.org/tap-water/getawaterfilter. Once you’ve settled on a price range and filter style (e.g. pitcher, faucet-mounted) and determined from the database the pollutants you want to remove, you can link directly to websites that sell filters able to remove those pollutants. This entry was posted on Friday, April 16th, 2010 at 8:39 am and is filed under California, health, Orange County, pollution, science, sustainable living, toxics. You can follow any responses to this entry through the RSS 2.0 feed. You can leave a response, or trackback from your own site. 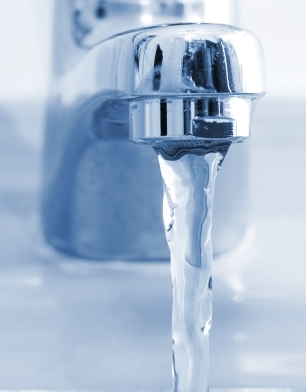 One Response to Is Your Drinking Water Safe? Thanks for addressing all the thorny issues in one well written article. Especially compelling is the fact that bottling companies are not required to list contaminants– when we drink bottled water, we do so while engaging in blind faith. But gulping glasses of unfiltered water sourced from the sink requires an equally huge leap of faith. Globally it isn’t just peak oil supply we need to be concerned about. Of even more concern is “peak water” supply.